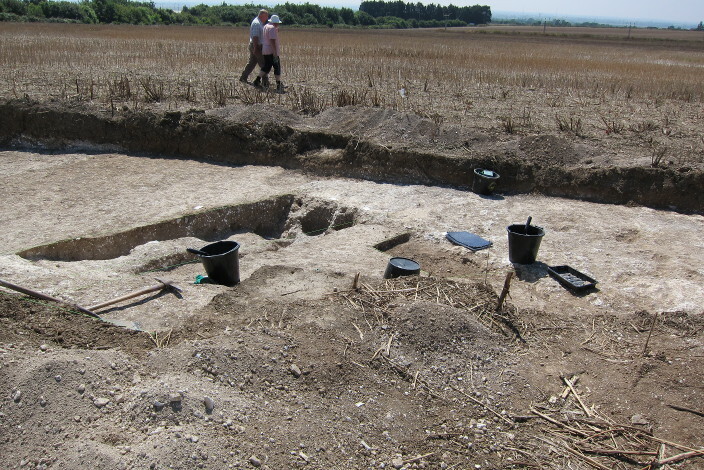 Building on the experience of several one and two day IOTAS digs over the previous 18 months we felt confident that we had the equipment, the experience and enough interest from members to run a full week’s dig for the first time since Abbey Farm Villa in 2004. Having obtained permission from the landowner David Steed, one of the Society’s Vice-Presidents, it was agreed that we should revisit the well-known Neolithic to Early Bronze Age ceremonial landscape, situated at the Lord of the Manor end of Haine Road in Ramsgate. The dig was directed by Nigel Macpherson Grant with the logistics organised by the Fieldwork Committee of the Society. 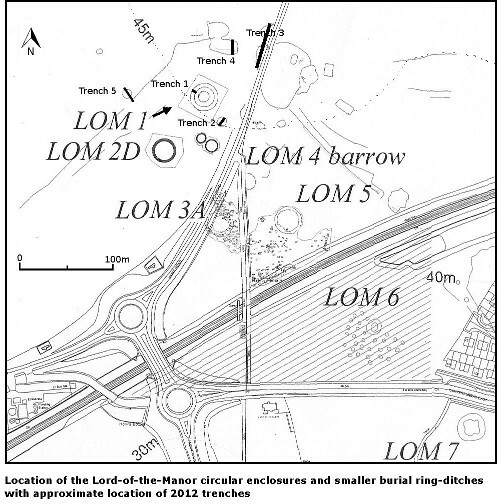 The ditched enclosures and barrows marked as LOM 1-6 on this plan are part of an extensive site in use between c.2800-1700 BC. The large early Anglo Saxon cemetery is on the eastern side of the road in the area of LOM3A and LOM5. This whole site was thoroughly investigated in the 1970s and 1980s by the Thanet Archaeological Unit (forerunner of the Society) and our director was part of the original Dave Perkins’ team at that time. Trench 1 was cut across the Later Neolithic enclosure LOM1 excavated in 1976 and revealed some new features including a cluster of Late Bronze Age pits cut into the fill of the ditch. 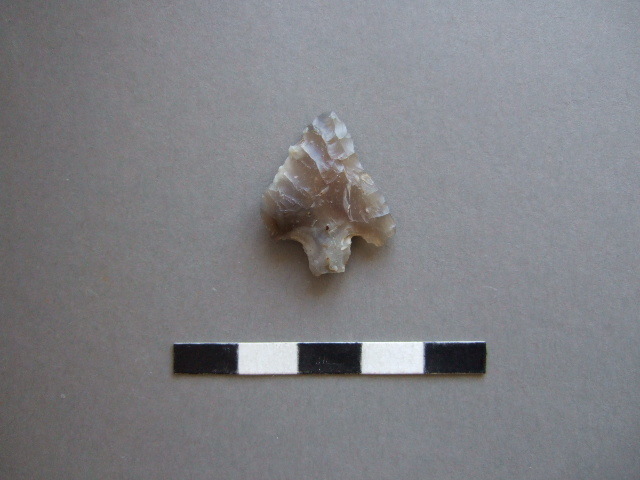 The discovery of a large fresh animal bone at the bottom of the ditch, and some charcoal, will enable the first radiocarbon dating of any of these circular monuments to be made. 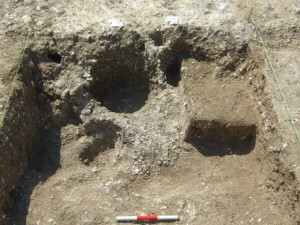 Trench 2 established that the feature it cut was a natural periglacial hollow. Trench 3 by the road cut a curved settlement boundary ditch showing on aerial photographs, and finds of pottery confirmed its date as Mid to Mid Late Iron Age. The shallower later straight ditch is likely to be Early to Mid Roman. 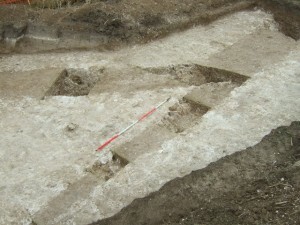 Both Trench 3 ditches cut a large irregular hollow at its northerly end most likely a quarry for chalk to marl adjacent fields and dated to the Medieval period. 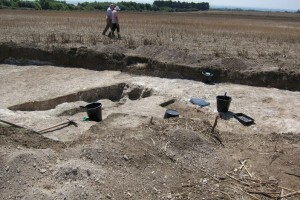 Trench 4 was inconclusive, probably showing another chalk quarry. 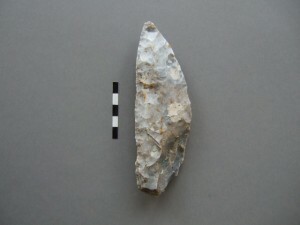 Two unstratified finds from trench 3 are shown above: to the left is an Early Bronze Age barbed and tanged arrowhead and to the right, a Late Neolithic to Early Bronze Age knife, the latter found at the end of the dig, sticking out of the side of the cut through the medieval quarry.